In this chapter, we give a rather restricted volume of known information about the brain, in order to facilitate understanding of the results of our measurements devoted to the connection of the brain with the cosmos. We show in Chap. 6 that the brain’s electromagnetic (EM) processes depend closely on space weather (see Chap. 4) and especially on geomagnetic storms. The mechanism of this dependence is not known (it is far from the only unknown mechanism of the electro-neurophysiology of the brain). 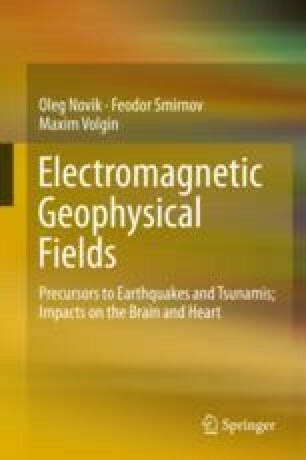 We suppose that the changes we have measured in the distribution of electrical potentials on the surface of the scalp during geomagnetic storms result from the interaction of the brain’s macro-EM processes with ones on the nerve cell (neuron) level. Thus, the structures of the brain and the neuron are discussed in this chapter. An introduction to electroencephalography (EEG) is provided because EEG is the basis of our measurements. Moreover, a section on brain rhythms (i.e., the frequency ranges of the brain’s EM processes) is included because, according to our EEG measurements, the theta rhythm is the phenomenon that most effectively demonstrates the distinctive dependence of the brain on space weather.